Hyper focal distance is one of those terms everyone heard—and mostly ignored—in photography class. However, if you want to take your photography to the next level—particularly if it involves grand landscape, soaring vista type stuff—wrapping your brain around the concept of maximum depth of field can get you there. Hyper Focal-Focused: Enter your camera type, aperture, and focal length, and HFD Calculator tells you the hyper focal distance for a shot. Bhupendra Yadav’s HFD Calculator app can tell you precisely, in either feet, inches, meters, or centimeters, the point where the hyper focal distance lies. 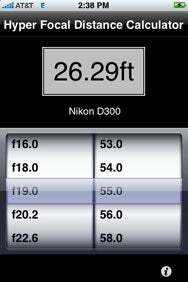 The app uses algorithms based on your camera type, lens aperture, and focal length to come up with the exact spot. It’s up to you to have your camera on a tripod and to manually focus—neither of which your iPhone can help with (yet…)—and then click away. HFD Calculator has a very simple-to-use interface. Choose your camera type from more than 150 options, enter the aperture and the focal length, and the HFD appears at the top of the screen. The app very quickly recalculates as your parameters change. From large format (4x5, 8x10), medium format (6x9, 6x17), 35mm, and a huge variety of digital and DSLRs, HFD Calculator’s impressive list of cameras has you covered. The 1.0.7 version of this handy utility even includes video options for 8mm and 16mm. HFD Calculator is compatible with any iPhone or iPod touch running the iPhone 2.x software update.